Product #15646 | SKU MB_SPCX-X-BM1 | 0.0 (no ratings yet) Thanks for your rating! 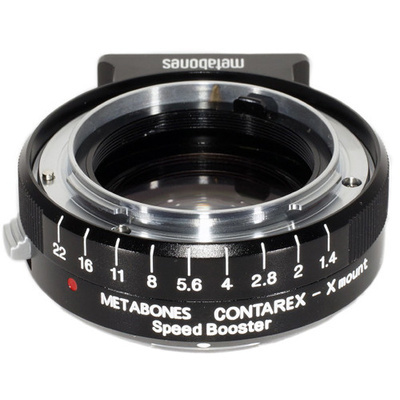 The Contarex Lens to Fuji X Camera Speed Booster from Metabones allows Contarex lenses to be mounted to Fuji X-Mount APS-C format cameras, increasing the angle of view and the maximum aperture of the lens by 1 f-stop. This photo accessory also comes with a detachable tripod foot that is compatible with Arca Swiss, Markins, and Photo Clam ball heads. The Speed Booster condenses light from the lens and projects it onto the APS-C sensor without vignetting; this allows the sensor to capture all of the lens' transmitted light and effectively produce full-frame coverage on non-full-frame sensors. A corresponding increase in the maximum aperture of 1 stop makes the lens more effective in low-light situations and able to create a shallow depth of field. Metabones' Speed Boosters are made of machined brass, finished in satin black, the camera-body, and chromium-plated on both mounts to ensure smooth mounting and reliability. Automatic diaphragm (AE metering) and other auto functions are deactivated while Speed Booster is attached. Electronic integration of aperture diaphragm controlled from the camera body.